Dedicated to style, these Paolo Vandini designer lace-up brogue shoes are a unique, high fashion option, ideally suited to men looking for a premium finish and quality craftsmanship. The Thane navy blue shoes from Paolo Vandini have tonal shading at the toe and heel on hi-shine waxed cow leather uppers and their own take on brogue deailing. 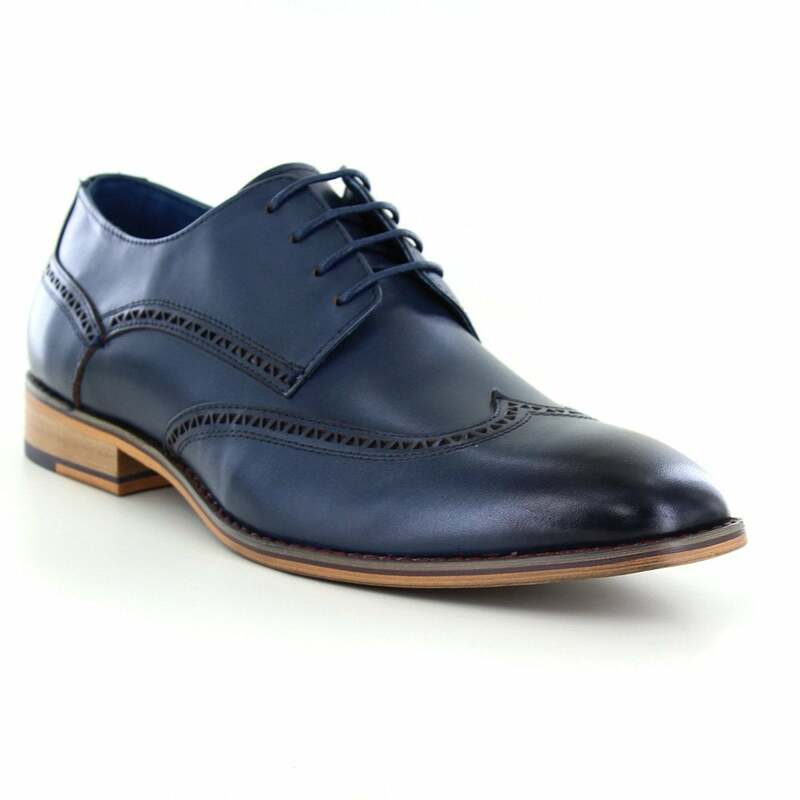 The lace-up of these premium, men's leather shoes from Paolo Vandini continues the quality feel with a formal, 4-eyelet arrangement; thin, colour matched navy, rounded laces can be seen spiralling through blind eyelets to provide a comfortable, customised fit. Inside, the lining is made of punched leather, while the insole is padded to provide a premium level of comfort and finish. Stitching on the shoes is high quality and perfectly compliments the appearance of the leather, blending in for minimal distraction from the detail features. A stack effect heel standing 3cm (1 inch) tall completes the mens shoe. These premium, men's leather shoes from Paolo Vandini are a perfect example of quality craftsmanship which all men look for in their footwear. The Thane Mens Leather Lace-up Brogue Shoes are a perfect addition to any formal or high fashion outfit!